London, Hong Kong, 21st September 2005: The ASEAN Finance Ministers’ Investors’ Seminar today announced the launch of the new FTSE/ASEAN indices, created in partnership with FTSE Group. The indices are designed for trading and benchmarking of financial products in the South East Asia Region and begin calculation today. The series has been initiated by the ASEAN Finance Ministers to brand ASEAN as an asset class and as a benchmark for ASEAN performance. 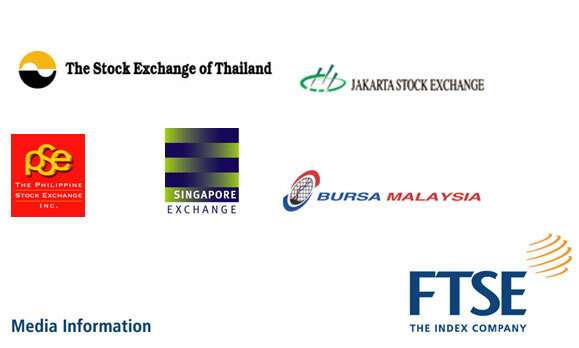 The project is the first cooperative effort between the five ASEAN exchanges, namely Bursa Malaysia, Jakarta Stock Exchange, The Philippines Stock Exchange, Singapore Exchange and The Stock Exchange of Thailand. Two indices have been created; FTSE/ASEAN Index that has 180 constituents and will be the benchmark for the five markets, and the FTSE/ASEAN 40 – the tradable index suitable for institutional and retail funds, Exchange Traded Funds and derivatives contracts. These indices are the first internationally recognised indices that have been created for the ASEAN equity markets as a regional grouping. The indices were designed using international standards, are free float adjusted and based on the Industry Classification Benchmark (ICB). FTSE Group is a world-leader in the creation and management of indexes. With offices in Beijing, London, Frankfurt, Hong Kong, Madrid, Paris, New York, San Francisco, and Tokyo, FTSE Group services clients in 77 countries worldwide. It calculates and manages the FTSE Global Equity Index Series, which includes world-recognized indexes ranging from the FTSE All-World Index, the FTSE4Good series and the FTSEurofirst Index series, as well as domestic indexes such as the prestigious FTSE 100. The company has collaborative arrangements with the Athens, AMEX, Cyprus, Euronext, Johannesburg London, Madrid, NASDAQ and Taiwan exchanges, as well as Nomura Securities, Hang Seng and Xinhua Finance of China. FTSE also has a collaborative agreement with Dow Jones Indexes to develop a single sector classification system for global investors. Bursa Malaysia Berhad is a public company limited by shares under the Companies Act 1965. Bursa Malaysia is an approved exchange holding company under Section 11D of the Securities Industry Act 1983. Other companies in the Bursa Malaysia Bhd Group of companies include a stock exchange, a derivatives exchange, an off-shore international financial exchange, equity and derivatives clearing houses, a central depository, an information services provider and an Information Technology services provider. Bursa Malaysia Securities Berhad, a wholly-owned subsidiary of Bursa Malaysia Berhad, is an approved stock exchange under Section 8 of the Securities Industry Act 1983. PT Bursa Efek Jakarta (Jakarta Stock Exchange), the Company, was established in 1992. In accordance to the Indonesian Capital Market Law, Law Number 8/ 1995, the main purpose of the PT Bursa Efek Jakarta (Jakarta Stock Exchange) is to establish a a regular, fair and efficient securities trading activities. The Philippine Stock Exchange, Incorporated owns and operates the only stock exchange in the Philippines. The Securities and Exchange Commission granted the company the status of self-regulatory organization in 1998. It was incorporated in 1992 as a non-stock corporation and underwent a listing by way of introduction in 2003, pursuant to the demutualization mandate of the Securities Regulation Code of 2000. In addition, the PSE is now 40% owned by four strategic investors by virtue of private placement in 2004. Singapore Exchange Limited (SGX) is Asia-Pacific’s first demutualised and integrated securities and derivatives exchange.